The neurobiological model of CFT sees key anxieties as emerging from the interaction between the life history of the person and the “tricky” nature of our evolved brains (Gilbert, 2000, 2009, 2014). Traumatic memories are tagged by the brain’s threat-based alarm system, called the amygdala, as emotionally significant (Steel, Fowler, & Holmes, 2005). In addition, complex subsystems in the brain unconsciously record expectations regarding social experiences (Fonagy, 1996; Siegel, 2010). Such emotional learning brings about protective actions (Gilbert, 2000; Ogden, Minton, & Pain, 2006). Trauma and its impact on the amygdala compels us to act in particular self-protective ways, for example, fight, flee, freeze, collapse, cry for help, and appease. Such reactions will be represented in people’s best efforts to cope and may unfortunately have unintended consequences which reinforce the key fears and impulses (Gilbert, 2009). 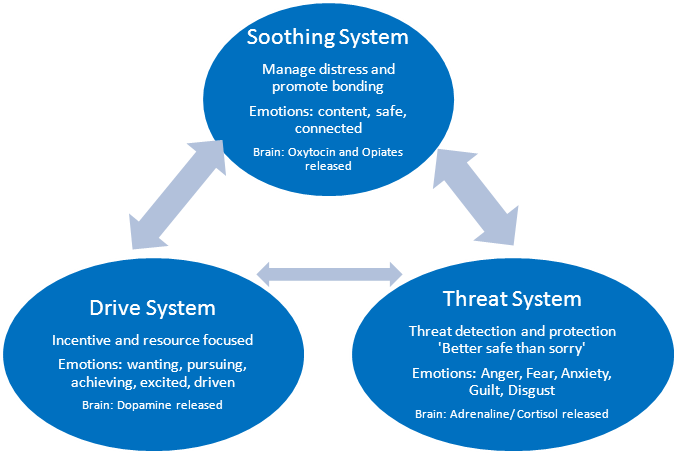 The CFT model uses the soothing and drive systems (Depue & Morrone-Strupinsky, 2005) to moderate threat responses and facilitate emotional recovery. Compassion is an active engagement with suffering motivated toward well-being (Gilbert & Choden, 2013). The CFT model has been used successfully with a range of different presentations including …eating disorders (e.g., Goss & Allan, 2010). Its application to PTSD and emotionally unstable personality difficulties shows the effectiveness of harnessing the power of compassionate motivations and skills in managing trauma-related conditions (Beaumont, Galpin, & Jenkins, 2012; Lee, 2012; Lucre & Corten, 2012). Eye movement desensitization and reprocessing (EMDR) is an established treatment for trauma-related issues (Shapiro, 2001), with strong evidence for its efficacy in the treatment of PTSD (Bisson & Andrew, 2007; Maxfield & Hyer, 2002). The theory underlying EMDR posits that when a memory of a disturbing event is inadequately processed, neural networks can hold related perceptions, emotions, bodily sensations, and cognitions in a state of potential activation similar to the time of the event. EMDR therapy was developed to process disturbing memories and to address associated bodily sensations of distress, beliefs, triggers, maintenance factors, and skills needed to enhance prospective functional behaviors. It uses bilateral stimulation to facilitate connections between neural networks and disparate streams of information processing, including more adaptive compassionate aspects of self (Shapiro, 2001). Kennedy, A. (2014). Compassion-Focused EMDR. Journal of EMDR Practice and Research, 8(3), 135-146.